I love making albums with customer photos. Each one is unique and some are quite challenging. But I also love, love, love pretty fabrics and I love to put them together in neat combinations. Sometimes it’s easy because coordinates are sitting right there on the fabric store shelf! I found that yesterday in my local fabric store. yippee! 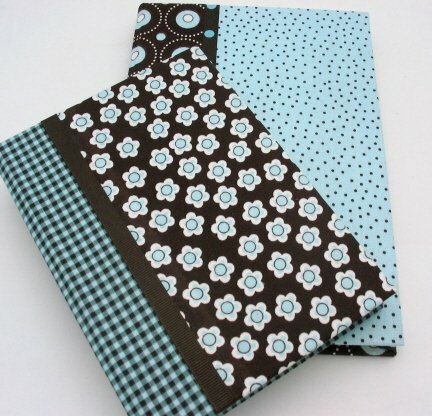 And I made these very journals with that pretty fabric! Aren’t they fun? The best part is that making these journals, which didn’t take a terribly long time yesterday, gave me such renewed inspiration. I got so much done on my orders last night and today, and I’m anxious to list more new things. I just wish there were more time in each day so I could just shop for fabric and make new stuff. And to think, I’ve been trying to stay away from the fabric store because I can’t resist buying fabric. It pays off though when it provides inspiration!